The Best of Raw Food is a free diet plan which focuses on providing nutritional information and recipes for eating a raw diet. As you might have guessed from its name, a raw diet consists mainly of food and drinks which are uncooked. The site doesn’t go into a lot of details as to how exactly you lose weight using this diet, but claims that it works. If we’re inclined to believe the claims, this is a simple diet to follow. The aim is to eat at least 75% raw food, including smoothies and other drinks. The remaining 25% is yours to do as you please, whether it’s a coffee or a slab of steak. Without cooking or refining, food ought to be harder to process through your system, burning more calories and helping you to extract the nutrients over time. TheBestofRawFood.com provides a range of recipes to follow, all of which are pretty basic since there’s no actual cooking involved. Ingredients are also quite cheap and many of the foods are suitable for vegans and vegetarians. Whilst the meals and snacks recommended are fine, there aren’t all that many of them, so you might wish to look for additional recipes elsewhere. There are a few somewhat unsubstantiated claims on the site, including a link to Simply Raw, which suggests you can reverse diabetes in 30 days. Of course, if you do plan to try one of these diets, it’s advised that you seek medical advice if you’re not sure how it might impact on your health. You can download shopping lists to make your grocery shop a little easier, plus read a range of information including a fairly useful FAQ and “How to” list. However, that’s pretty much where the features stop, and if you want to keep a track of your weight loss, then you’ll need to use another site to find the appropriate tools to do so. You can subscribe to a raw foods magazine or check out the blog pages, though it’s not clear how often the blog is updated. There are no community features to speak of and no exercise tips. 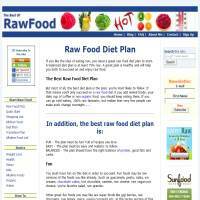 This is a free site, but it really only offers a few recipes and some details of what the raw food diet involves. If that’s all you need, and you’re interesting in trying a raw diet, this site could serve you well. Otherwise, we feel it’s lacking key information and features to really offer a great service.